Joy Creek Photo Archive (c) all rights reserved Myrtus communis subsp. 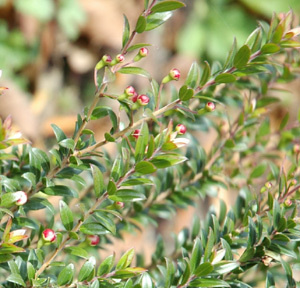 Tarentina is a compact form of myrtle with semi-glossy, narrow, green leaves that are aromatic when crushed. During the winter, the evergreen foliage takes on reddish tones. The white flowers are blushed with pink. This is a terrific small shrub for a hot, dry site. Summer to early autumn. 3 ft. x 3 ft.